News — Sadona Salon and Spa | Annapolis, MD | A full-service salon and spa located in downtown Annapolis. Sadona Salon + Spa, a new concept in full-service beauty and wellness services, celebrated its official opening at 15 West St. in downtown Annapolis with a gala ribbon cutting and open house on Jan. 4, 2017. 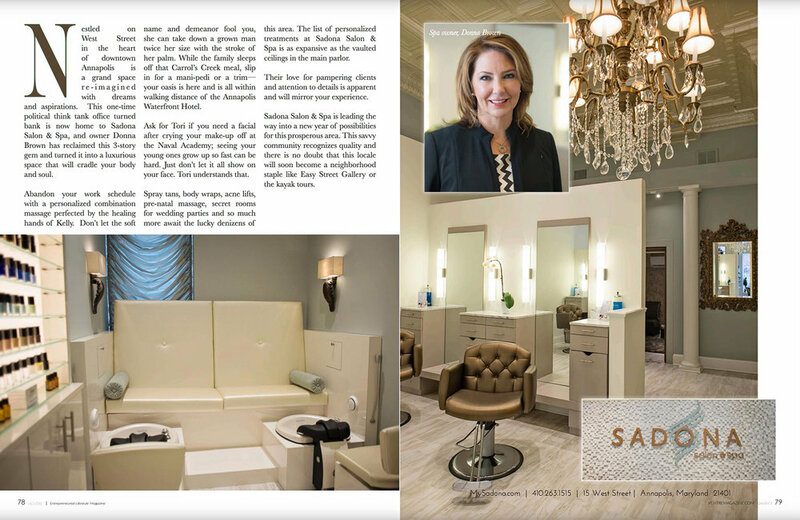 Sadona Salon + Spa was featured in the 2017 New Year Issue of Ventre Magazine. See the full issue here. Our town has had a long standing love for the 1904 building at 15 West Street that was originally started as the Annapolis Savings Institution. This building was also home to another bank and even the regional headquarters for the Republican Party. Today, it is about change through new ideas and renovation. With integrity and honor of tradition, our building has been completely remade into a new concept salon and day spa with some extra surprises. The treatments are inspired from around the world and actualized through U.S. products.